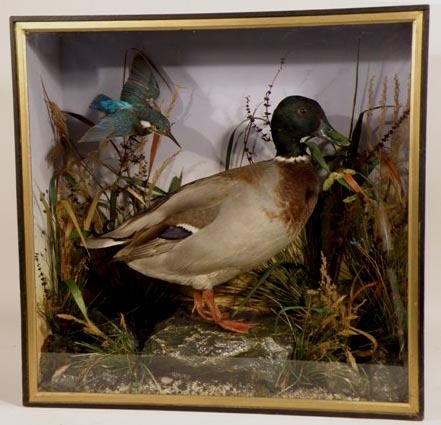 Victorian Antique Taxidermy by Hutchinson of Derby. We get asked to recommend Victorian Taxidermy dealers and Victorian Taxidermy Resources by our friends, we now include below a list of those we have had favourable feedback on this is not a complete list, if you don't find what your looking for then please feel free to contact us. If you also wish to link to us then your taxidermy information shall only be placed in the appropriate class. It would appear that This company began business around 1870's. The company was one of the most prolific taxidermist firms in Britain and their work is considered to be of a very high standard. 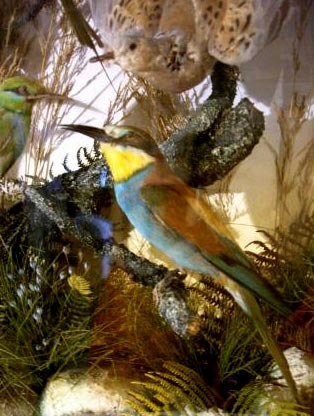 Although British birds features in the taxidermy work, perhaps they are best renowned for large cases of exotic birds. The noted Derby taxidermist undertook work for wealthy patrons and also musuems. Hutchinson was the co-author of the Birds of Derbyshire dated 1893. 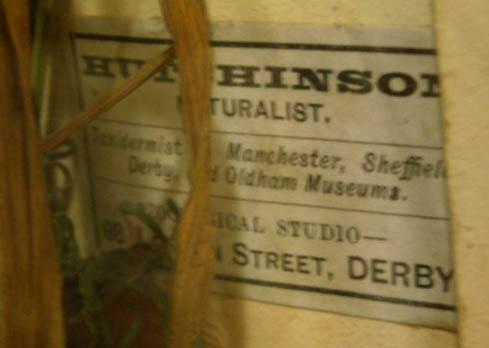 A.S Hutchinson was respondsible for the establishement of the C Seebohm collection in Sheffield musuem. 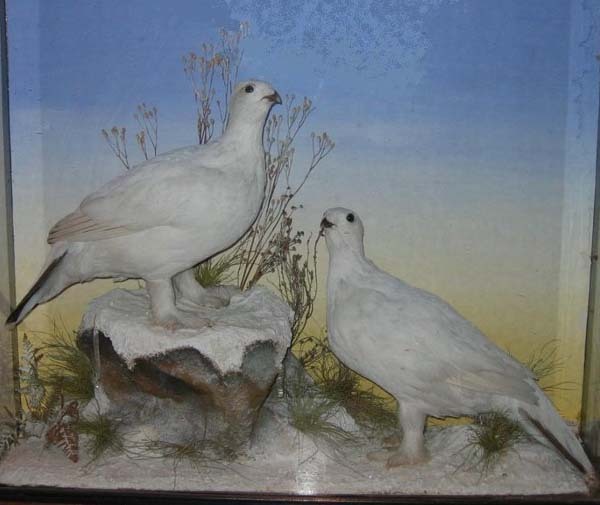 This style of taxidermy was perhaps best regarded as one of the best and most prolific provincial taxidermists. Groundwork is very distinctive resembling that of James Hutchings. However the style of case was principly "flat front" cases with a single pane of glass to the front. It is however the mixture of birds in each cases that sets them apart from others. Very little attention appears to have been paid to habitat for each bird. Pair of birds in cases is extreamely rare. European Fox by Hutchinson of Derby. Mallard and Kingfisher by Hutchinson of Derby. 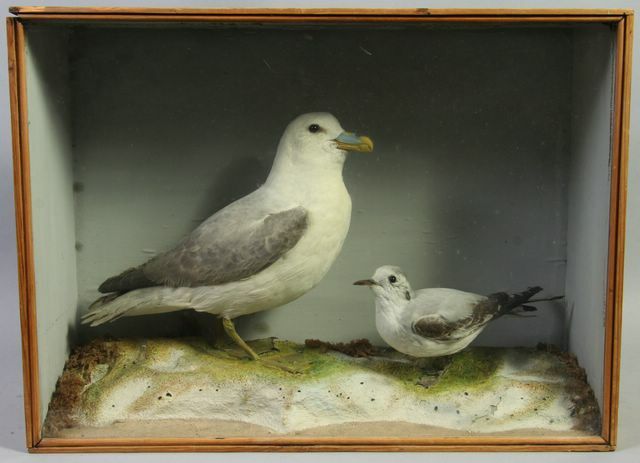 Fulmar and Kittiwake by Hutchinson of Derby. 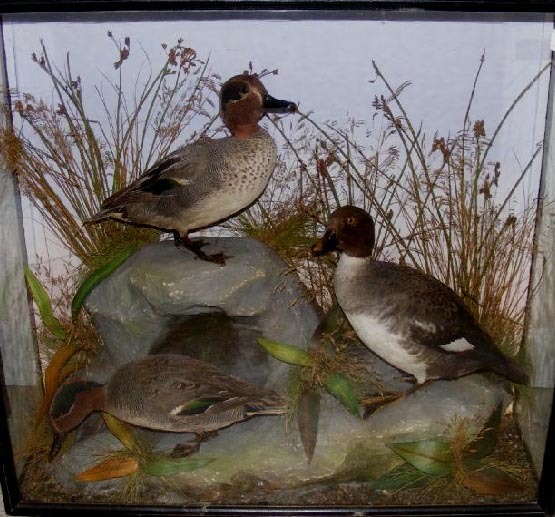 Teal and Goldeneye by Hutchinson of Derby. Black Throated Diver by Hutchinson of Derby. Fox cub with Lapwing prey by Hutchinson of Derby. Abberation Blackbird by Hutchinson of Derby. Jack Russell Terrier by Hutchinson of Derby. 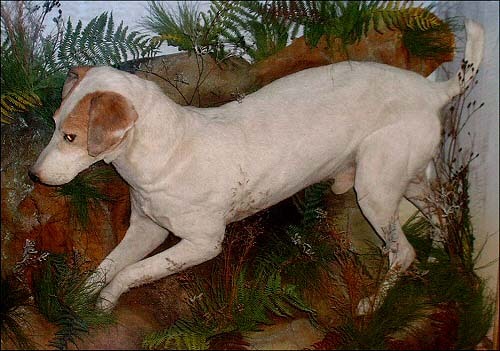 This is an interesting item as it is likely that this dog may have been favoured for its hunting prowess in terms of hunting rats, badgers and foxes. Rare item given the subject matter. 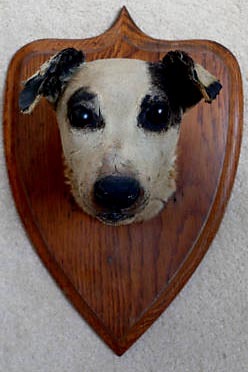 Judging by the scars on the face this dog had an interesting life..
Jack Russell Terrier by Hutchinson of Derby. 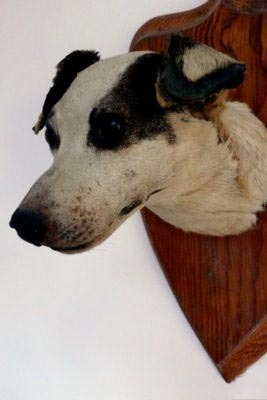 This is an interesting item as it is likely that this dog may have been favoured for its hunting prowess in terms of hunting rats, badgers and foxes. Rare item given the subject matter..
Bull Mastiff by Hutchinson of Derby..
Well composed family of Tawny Owls. Arrived in today so to speak. More images to follow. Detail of the above case. 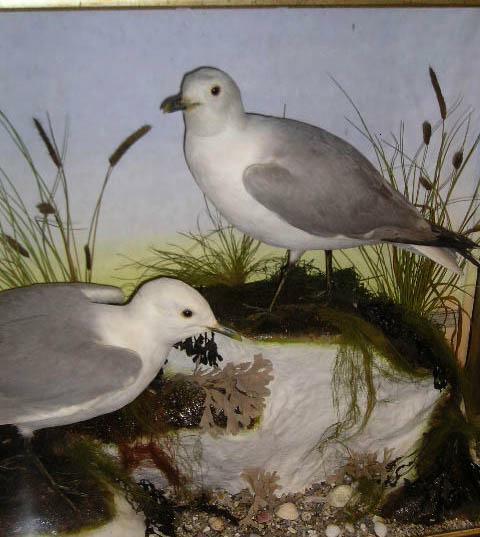 European Kittiwakes by Hutchinson of Derby. Thanks BD. 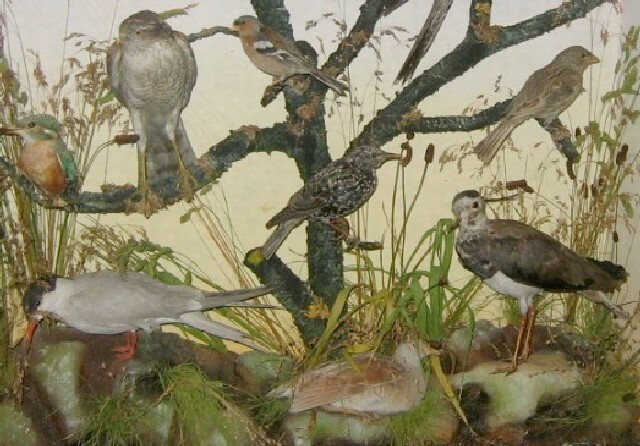 Large mixed case of birds by Hutchinson of Derby. Hooded Crown by Hutchinson of Derby. 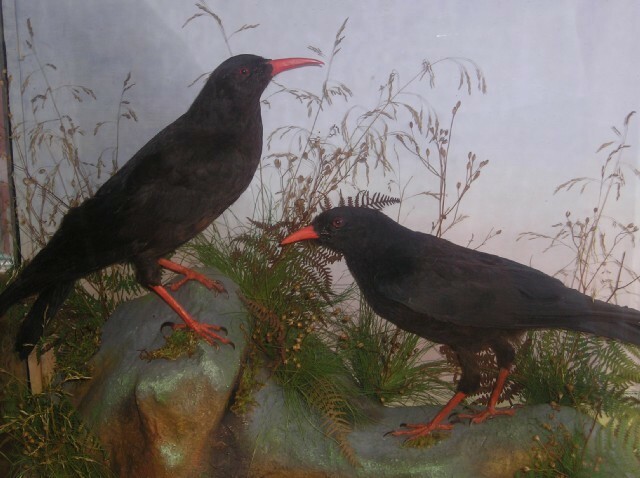 Cornish Choughs by The famous Victorian Taxidermist Hutchinson of Derby. 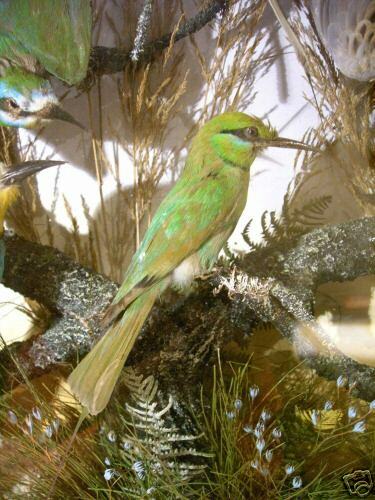 This firm were famous for their mixed cases of both British birds and Exotic birds imported following Darwin's successful expeditions around the globe. Choughs were extinct from Cornwall for a number of years, but it is understood that they are now back and numbers are increasing steadily. Label by Hutchinson of Derby. Thanks BD. Red Fox with Rabbit prey by Hutchinson of Derby. 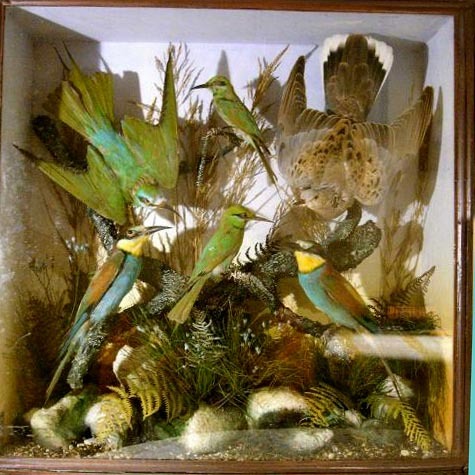 Victorian mixed case of North American birds, by Hutchinson of Derby. Many thanks Henry..Contents from left to right.Mountain Bluebird, Yellow Headed Blackbird, Mousebird, Western Tanenger, American Robin, Fairy Wren, Red Winged Flicker, Cinnamon Teal, Azure Kingfisher, Kildeer Plover. 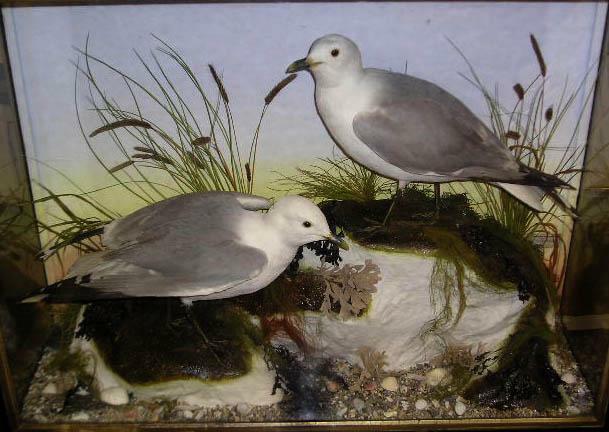 Sea birds by Hutchinson of Derby. Bee-eater by Hutchinson of Derby. 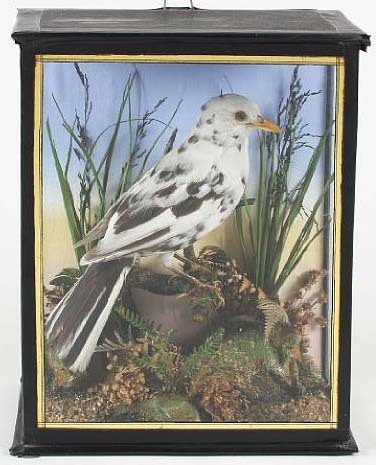 Deatil of another Victorian mixed case of birds by Hutchinson of Derby. 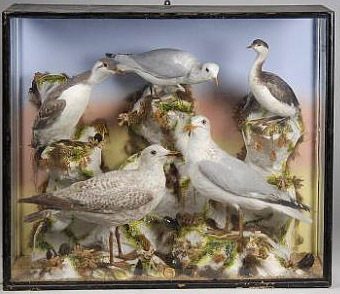 Hutchinson did undertake placing a baffling mixture of taxidermy birds in each case. I have no idea why such species were placed together. 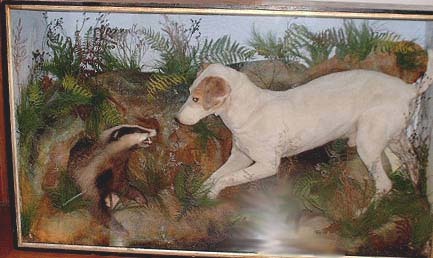 The taxidermy however is always of the highest standard. Interesting item relating to Seabirds as pictured above WHEREAS during several years past the birds commonly designated gulls or sea-gulls, which formerly abounded on the coasts of this Island, have become very scarce by reason of the extensive destruction of them by persons seeking their plumage: And whereas it appears, by evidence taken before a Committee of the Tynwald Court, that the said birds are considered of great importance to persons engaged in the herring fishing, inasmuch as they indicate the localities where bodies of fish may be: And also that they are of much use for sanitary purposes, by reason that they remove the offal of fish from the harbours and shores: And it is deemed advisable to prevent the destruction of the said birds. We, therefore, your Majesty's most dutiful and loyal subjects, the Lieutenant-Governor, Council, Deemsters, and Keys of the said Isle, do humbly beseech your Majesty that it may be enacted, and be it enacted, by the Queen's most excellent Majesty, by and with the advice and consent of the Lieut.-Governor, Council, Deemsters, and Keys, in Tynwald assembled, and by the authority of the same, as follows (that is to say) :- 1. 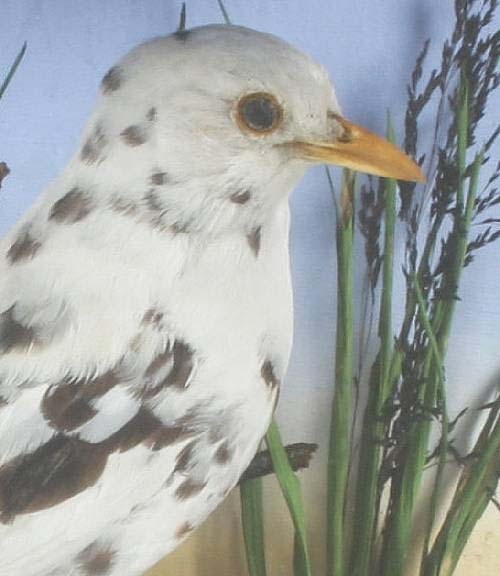 This Act may be cited for all purposes as ` The Sea-Gull Preservation Act, 1867.' 2. In the construction of this Act the word 'Gull' shall include the black-headed gull, the common gull or seamew, the herring gull, the kittiwake, skua gull, and every other species of gull or sea-gull, by whatever name it may be distinguished; and shall also include the gannet or solan goose, the shag 1 and the guilimot,2 and it shall be sufficient in a prosecution under this Act to prove with respect to the nature of the bird, that it is commonly known in this Island by any of the foregoing designations. 3. Any person who within this Island or within the jurisdiction of the Admiralty Court 3 of this Island, shall wilfully kill or destroy any gull, or shall take from the nest an egg of any gull, or shall wilfully break, spoil, or destroy an egg of any gull in the nest, shall for each offence forfeit and pay a sum not exceeding five pounds. 4. Any person who shall have in his possession any dead gull, or any undressed plumage having the appearance of being recently stripped from any gull, or an egg of any gull, shall be deemed to have killed or taken such gull or egg as aforesaid, unless he shall prove the contrary. 5. Every penalty or forfeiture payable under this Act shall be proceeded for and recoverable as in the case of summary proceedings taken under the Petty Sessions Act, 1864,4 and at the suit or instance of any harbour-master, constable, or any other person, before a High Bailiff or a Justice of the Peace, anything in the said Act to the contrary notwithstanding. 6. One moiety of every penalty recovered under this Act shall be paid to the informer. Provided always, that it shall be lawful for the Governor, in his discretion, to remit, mitigate, or suspend the payment of such penalty. Royal Assent dated 29th February 1868. Promulgated 6th July 1868. 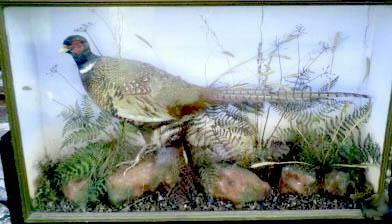 Pheasant by A.S.Hutchinson of Derby. 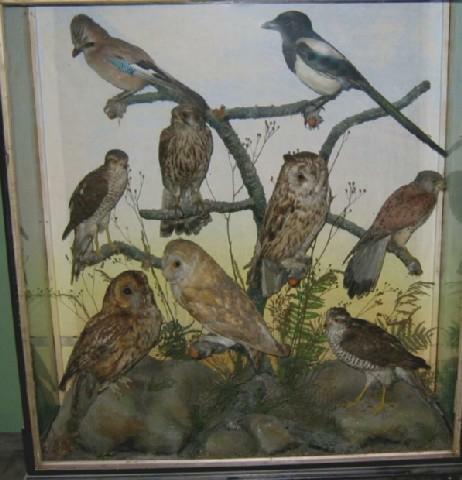 VIctorian mixed case of Woodland birds by Hutchinson of Derby. Well-presented cases and very fine taxidermy were their stock in trade. 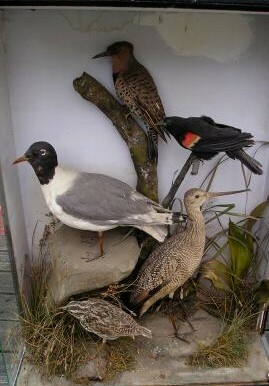 They specialized mainly in birds producing some spectacular and large examples of exotic taxidermy. 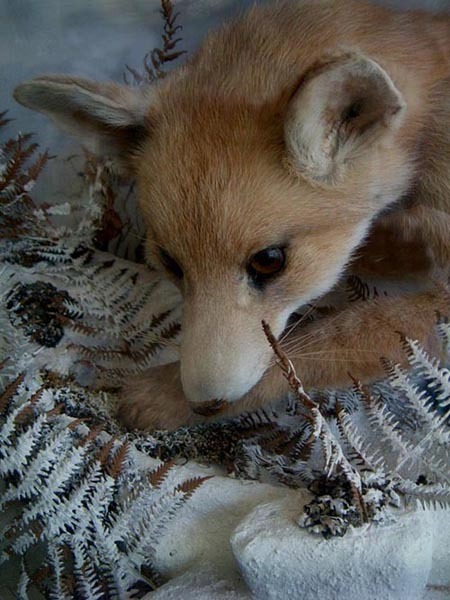 Foxes and badgers were also produced, but are not as common as bird cases. ITEMS WANTED. Please respond via this on-line form HERE with a description of what you have for sale. 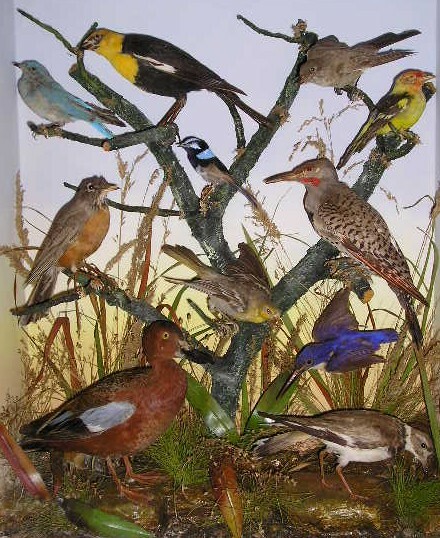 John Gould, "The Bird Man"
Taxidermy Links. Please double click on the Taxidermy link icon below.